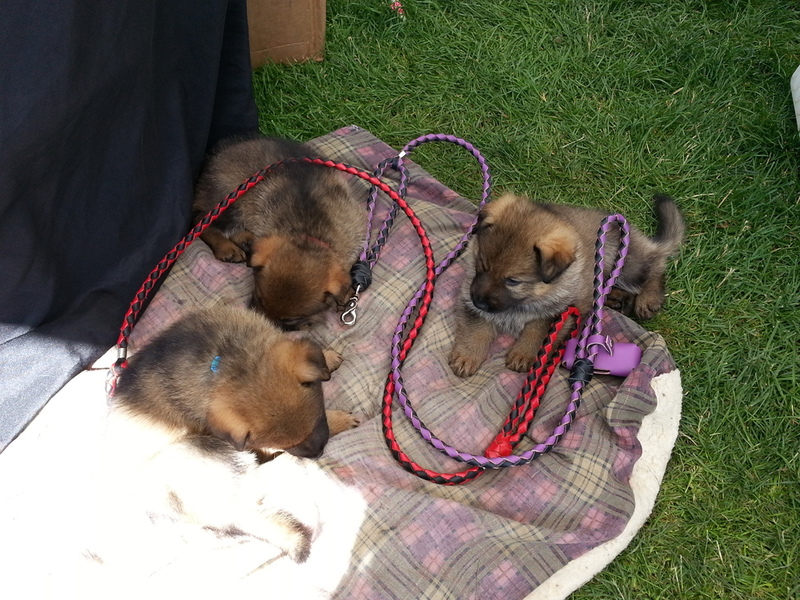 Arizona German Shepherd Breeder.Exceptional quality working line German Shepherds. Bred for the intelligence and sensitivity needed by family companions and service dogs. Extensive socialization and early training.Hip and Health Guarantee. We believe dogs possess a spirit, that they feel happiness, sadness, boredom, frustration, loss, fear, joy--a variety of emotions. We believe that we are responsible for the quality of our dog's lives. We raise and nurture a limited number of hand-picked, exceptional quality, old style German Shepherds so that we can promote a high quality of life for them and their offspring. All of our dogs are OFA certified for hips and elbows. We also test all of our breeding dogs to ensure that they are MDR-1 and DM negative. 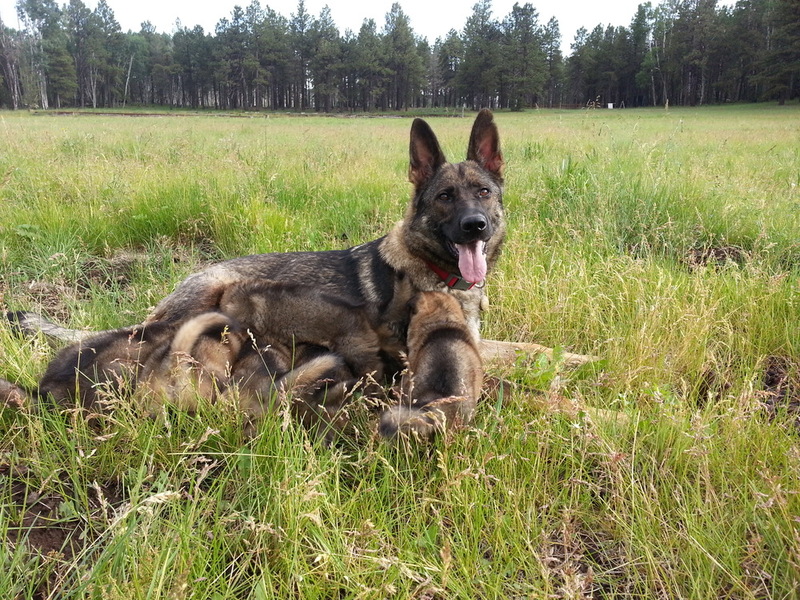 Our dogs are not warehoused or kept in kennels but run free on fifteen, dog-fenced acres in the high mountains of Northern Arizona. Tre'Good German Shepherds embody Joie de Vive, or in English, exultation of the spirt. We hold firm to the idea that a dog should live not solely for us, but also for themselves. We reject the business notion that dogs should be raised in a style that is easy for the breeder, but unpleasant for the dog. We believe that there is a better way to raise our loyal family companions. And we believe that our philosophy in practice creates better family dogs. A quick game of fetch before we head into town for an agility class. All dogs are pack animals; but a German Shepherd in particular will bond with a special human of its own. Each of our breeding dogs is paired with one of us, but also bonds with other dogs during play and daily hikes in the mountains. The combination is critical for a Tre'Good dog. A human bonded dog will teach it's puppies how to live within a human pack in a human centric world. Each breeding dog plays on the fifteen acres but also lives, travels, trains, plays, and sleeps with it's human. We have also learned that grandparents play a valuable role in the raising of our puppies, which is great for the puppies but also keeps the grandparents active and mentally stimulated. A healthy dog family leads to a happy family dog. All of our breeding dogs travel with their handlers. Dog parents who are confident and composed in the human world pass those traits on to their offspring when they are out together in the world. At Tre'Good German Shepherds we raise highly trainable, confident, joyful, intelligent, healthy dogs, who are capable of deeply bonding with their people. By keeping the needs of our dogs foremost, we produce family companions who are not emotionally or mentally stifled. Our dogs are vibrant, alive, and ready to form a solid bond with their new families. We raise our pups using the Tre'Good method, which utilizes nature and positive reinforcement to develop our pups and young trained adults. Training consists of games we play with our dogs. Our dogs look forward to their training sessions because we employ patience, clarity, and fun to develop a learning drive. But, just as important we teach our dogs that we will listen to them. Once a dog understands that s/he is working in a partnership instead of a dictatorship the amount of effort they put into training is astounding. We feed our dogs a raw, organic, grass-fed meat diet. Because we are environmentally conscious, we buy all of our meat from small family farms. We add blended raw vegetables, sweet potatoes, and other super foods to their diet and our dogs thrive. We cook the meat but not the vegetables and sweet potatoes that we feed our therapy dogs. For years we have watched our dogs forage for food on our land. But it wasn’t until we added our winter location, which is an old homestead farm, did we realize the amount of plant matter dogs naturally add to their diets. On the farm the dogs forage nuts, fruit, and vegetables from our garden. A dog will enter the garden and walk up and down the isles until s/he finds exactly what s/he is looking for. One day it may be a radish ) the dog eats the greens and the radish), another day a spaghetti squash, another time it may be a perfectly ripe bell pepper gently picked so there is no harm to the plant. Once the dog chooses her veggie she parades it around like it was a rabbit. After watching our dogs we now add a good percentage of vegetables, seeds, and low-glycemic fruits like Acai’, Macai or other berries to our dogs diets. We are supporters of raw and home cooked diets but we feel “for our dogs” the focus on a high percentage of protein and just a touch of veggies may be off from the dogs natural diet. We are constantly researching K9 nutrition to keep our breeding dogs in peak condition. We believe excellent maternal and paternal nutrition may protect your pup form the heartbreak of hip dysplasia and the ravages of cancer. We believe that the parents diets and maternal diet during pregnancy does count in the whole picture of your pups future health profile. Pre-made raw food may be an excellent food option but do your research, the addition of extra vegetables may be beneficial. We also use a worm composting system to recycle our dog's waste. We use this system so our pups poop doesn't end up encased in plastic in a waste dump. Tre'Good breeding dogs and Step Above young trained adults travel with their handlers. A seven-month old female is staying in a hotel over Christmas. She will attend a large family gathering where she will mingle with dogs, babies, and toddlers, while being exposed to noise, family games, and activities.